Ysera The Dreamer is located in Northrend in the Emerald Dragonshrine which is in Dragonblight. Eonar the Titan blessed Alexstrasza's younger sister, the lithe green dragon Ysera, with a portion of nature's influence. Ysera fell into an eternal trance, bound to the waking Dream of Creation. Known as the Dreamer, she would watch over the growing wilds of the world from her verdant realm, the Emerald Dream. 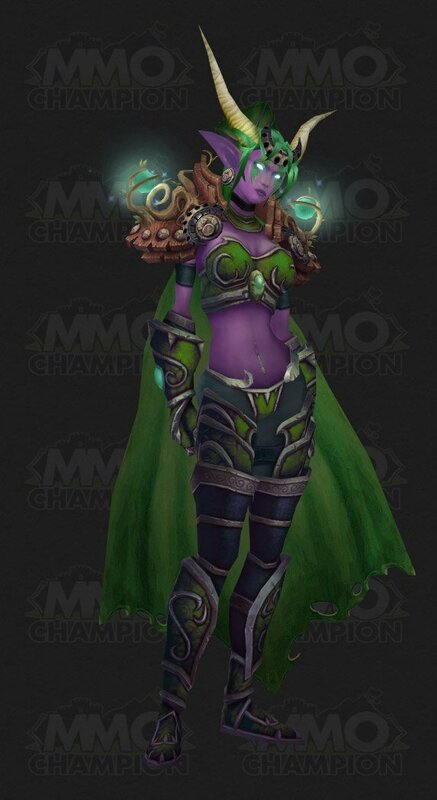 Ysera seems to be a member of the Wrymrest Accord even thought she remains in the emerald dream. Maybe Blizzard will give us more insight as to what is going on in the emerald dream. Then again, that could be the next expansion. And if its the twisting nether, we might see kil'jaeden again as thats where sargeras was traped and thats where kiljaeden is aswell. Has anyone tried seeing if http://wotlk.wowhead.com/?item=10589#comments alters the way she/her flight interacts with you? my first character being a draenei, i clearly remember http://wotlk.wowhead.com/?item=24049 yersa's tears as a quest. If you go up to Ysera realy close, you can see she is on some sought of big green statue. The statue is bald, and has markings all over it. 2. shes the most butch dragon out of them all. DO NOT WAKE THE DREAMER! The quote from Wailing Caverns: "You'll never wake "The Dreamer" " Comes to mind, despite it was referring to Naralex haha. then what is Emriss doing in duskwood? No wonder her liutenants turned on her, she doesn't even have her own model! No unique model, alas, unlike Alexstrasza or Malygos. Looks more or less like any other dragon, but ghostly. It is interesting to note that at the Bronze Dragonshrine, Bronze Shrine Wardens are fighting Infinite dragons. Also, the dragons all have an effect on them called "Battling Through Time" - as in, they're fighting, but in another period of history. Ysera, known as The Dreamer, is the leader of the Green Dragonflight and the guardian of the Emerald Dream. We don't see much of the Green Dragonflight in World of Warcraft or it's 2 xpacs so far - so far, there are a couple in the Swamp of Sorrows and Blackwing Lair, but little elsewhere. When the Emerald Dream expansion comes out, we will see plenty more in the new zone. It is likely that the Emerald Dream will be the next expansion. Ysera is finally seen in game, and the Dragon Aspects play major roles in Wrath of the Lich King, which may build up to a "dragon" expansion (either the Emerald Dream or Deathwing). In addition, 3 of the 5 Old Gods are dead (Yogg-Saron, C'Thun, the unknown one in Darkshore). The origins of the Nightmare that plagues the Emerald Dream was though to be originated either from Hakkar the Soulflayer (who is now dead) or an Old God. With only two Old Gods alive, our physical entrance into the Emerald Dream is likely to be soon. In addition, in this expansion players are able to enter the Emerald Dream - for a short time - during a quest chain started in Icecrown. This is the first time that players could enter the Emerald Dream, and it may be forshadowing a longer trip into the Dream. was Prince Toreth not her rider? She appears to be sleeping on a large statue of some sort that is covered with moss. I'm not sure what this has to do with the green dragonflight or the emerald dream, so does anyone else know what it might be there for? I hope this isn't the FINAL model of her, as a dragon aspect I think they should have their own unique model to look cool and...aspectish. i died in the area and on the way back to my body i noticed the dragon was gone half of a huge stone many in the water was there, i was like WTF! The statue she is sleeping in/on is a model that has been in game for quite a while, along with some of the more colorful flowers found in the area. Just search for a video of the emerald dream, which is what these objects were supposed to be used in at some future point. Fun fact: one of the barrow dens in Moonglade has even more of this art. The den is related to the druid epic flight form quest. Blizzard is such a tease! they should give her a heavily modified night elf form :\. the blood/high elf modified form doesnt suit her. They kept the green drakes eye's closed in occulus, why not hers? She snores. Loud. Like jet engines loud. Got to say...her new model is pretty hot. It is unique, have horns on her head like the dragon queen, only wrong thing is her eyes are not shut. Ysera is now a quest-giver in Mount Hyjal, she can be found by the lake underneath the roots of the world tree, Nordrassil. Despite this, her model as an emerald dragon remains in Dragonblight. Jaylen got a point about Nozdormu. The Infinite Dragonflight tried to stop the opening of the Dark Portal so the demons would no longer come to Azeroth from Outlands. The idea is....if the Dark Portal wasn't opened we didn't had neither Mount Hyjal(the demons wouldn't come) nor the Culling of Stratholme and no Old Hillsbrad Foothills. So is the Infinite Dragonflight really that bad? They FINALLY gave her a unique model? About damn time. If she opens her eyes and looks directly into yours, you can go completely insane passing into a permanent coma. seeing the thoughts and dreams of every mortal wile being a mortal yourself will do that to you.